The Maldon Neighbourhood Centre is conducting a survey of people living in Maldon and surrounds who have children under 12 years of age. We are trying to determine the childcare needs of residents, now and into the future. The lead researcher is Debbie Tolputt from Victoria University undertaking a Research Placement. We are asking families/parents/carers who fit this criteria – even if families do not require childcare - to complete the survey. The survey can also be downloaded here. Please return it to the Maldon Neighbourhood Centre, 1 Church St, Maldon 3463. Surveys will also be collected from key stakeholder such as the Maldon Pre-School, Maldon Primary School and others. 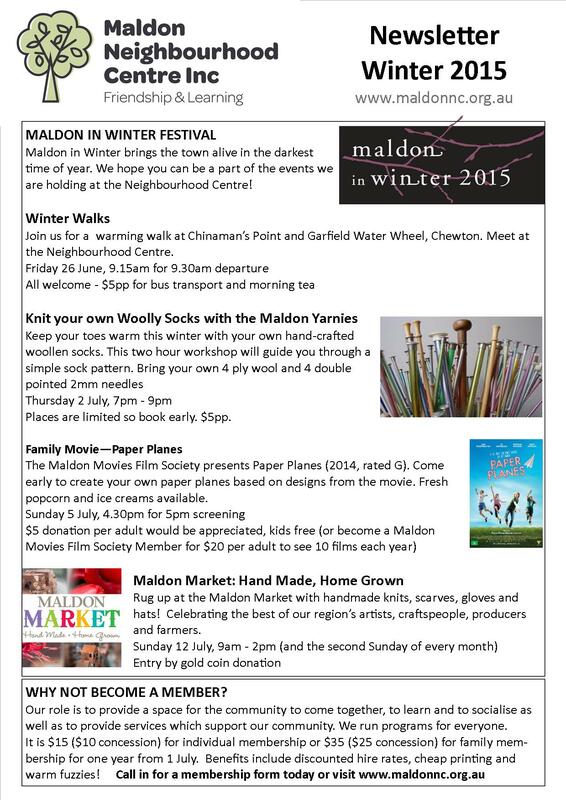 Please contact Amy Atkinson on 5475 25093 or info@maldonnc.org.au if you would like more information. Thanks to the generous support of the Foundation of Graduates in Early Childhood Studies, the Maldon Neighbourhood Centre has received $10 000 towards the upgrade and re-development of the outdoor playspace. We are looking for feedback on the Concept Drawings from interested members of the community. We will be seeking further funding to complete the work in stages over the coming year. Please contact Amy on 5475 2093 or info@maldonnc.org.au if you have any feedback your would like to contribute. Get your soil singing and hands dirty with this practical and comprehensive course. Learn the secrets of designing, creating and coaxing abundant growth from your edible food garden. From lawn to lunch or give your existing garden a makeover with fresh eyes. This course is informed by permacultural, organic and biodynamic principles and will cover saucy subjects such as plant propagation, seed saving, compost making, worm farms, soil health, crop rotation, biochar, pest and disease prevention, pruning, natural beekeeping, chooks in the system, garden design, wicking beds, wild foraging and much more! Be prepared to rub shoulders with soil microbes and get down and dirty with garden design! The course will be delivered by a variety of dynamic and experienced local teachers who will guide you in your practical learning journey from soil to seed. No food growing experience necessary! Telling Stories is something that binds a culture and a community - and the sharing of stories is often the motivation for people to come along to Josie Emery’s class at the Maldon Neighbourhood Centre “Telling Stories: Professional Writing for Print, Stage or Screen”. The Maldon Neighbourhood Centre has offered a Professional Writing course taught by Josie Emery since 2013. Josie Emery’s depth of experience spans universities, adult education, the national film school AFTRS and the national literature development program – the Literature Board of the Australia Council – for the federal government. Josie is also a published author, script writer and editor. It is packed full of fantastic fun stuff for all the family and lots of opportunities for friendship & learning. Call us or drop in for more info 5475 2093. We are open all school holidays Monday, Tuesday, Thursday, Friday from 9 - 3pm.